Backpacked on Eastern Santa Cruz Island last weekend. 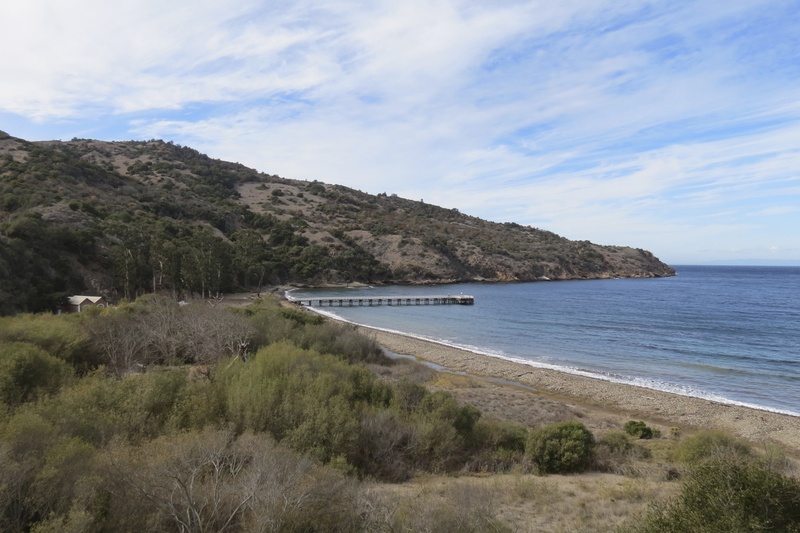 Started from Prisoners Harbor and hiked to Del Norte Camp, where I base camped and then day-hiked to Chinese Harbor and made a loop back along the Navy Road to the campground. Article appears in section A of today’s edition of the Santa Barbara News-Press. Because of the recent storm, the boat ride out to the island was bumpy. I think if it’d been any worse they would’ve canceled. At Prisoner’s Harbor I took some time to explore the immediate area, as the last time I was there I was anxious to press on. The wetland restoration is moving along and there are now several new interpretive signs. It was interesting to learn in my research that 50 percent of the original creek had been filled in with gravel and that the creek itself has been redirected and channelized because of the ranching operations and the construction of the navy road. The hike to Del Norte was easier than I’d remembered it from last time, probably because I knew I wasn’t backpacking to the other side of the island this time. The trail crosses several small drainages on its way from Navy Road to Del Norte Camp, and true its name Cañada del Agua did have a trickle of water in it although not very appealing looking. At Del Norte Camp I met the only other person camping there, William, also known as the Adventure Hiker. His exploits are chronicled on his youtube channel. Having set up camp with still some hours of daylight I decided to look for Del Norte Springs. 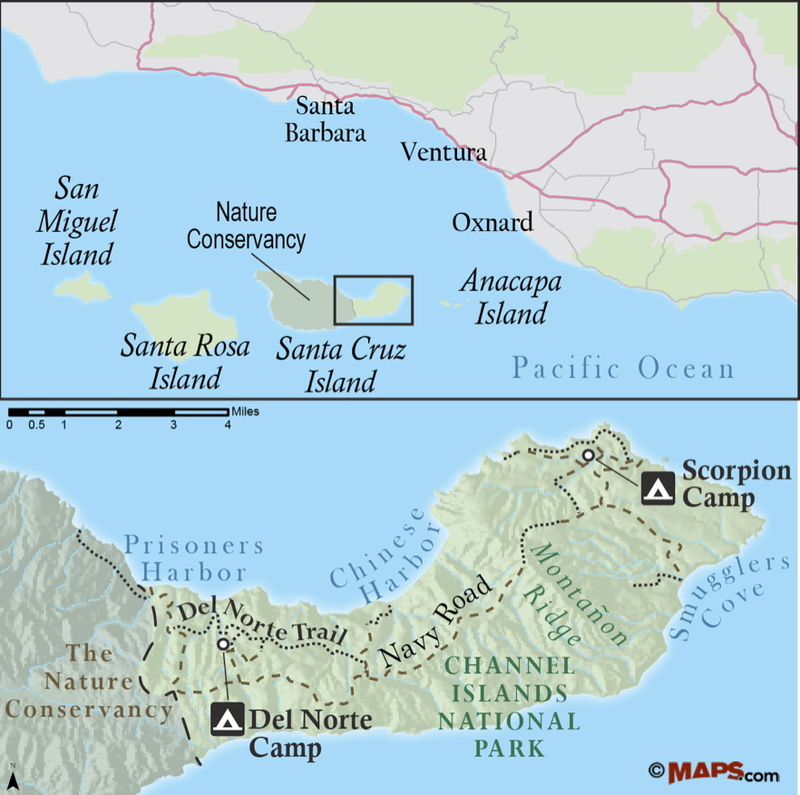 During a previous trip to the islands I had purchased Don Morris’ book A Guide to East Santa Cruz Island at the Channel Islands National Park Visitors Center. When I first found Mr. Morris’ book I was excited to see that he had described many of the off-trail routes I’d noticed on eastern Santa Cruz, however now using his book to try locate a specific site, I was somewhat disappointed with descriptions. For example, in his book, Mr. describes Del Norte Springs as being “upstream from the campground, about a half mile“ and surrounded by poison oak. However, Del Norte isn’t really on a creek. It’s at the top of a wash that drains down to a creek, okay. But even using that creek as a point of reference combined with his other clues didn’t lead me to the spring. What I did notice on my hike was an old road cut, now overgrown with fennel and coyote brush. More about that later. 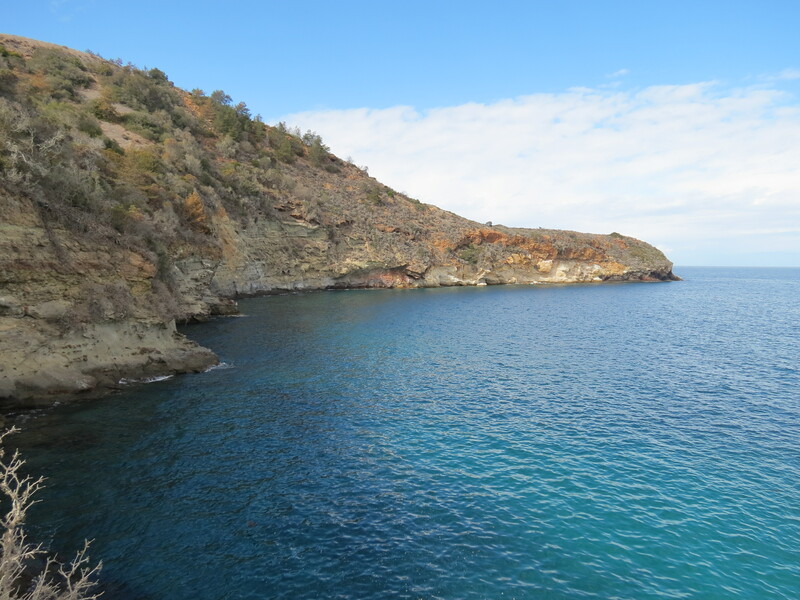 On Saturday, I heard William set out on his hike around 5AM for his 20+ mile hiking tour of the island. The last time I was there I’d gotten up at a similar hour to take in Chinese Harbor and backpack over to Scorpion Anchorage. This time I chose to sleep in. The hike down to Chinese Harbor was uneventful. Again trying to work with the information in Don Morris’ book I hunted around for a spring that was supposed to be located near the harbor, and while I had an enjoyable hike up a narrow creek I couldn’t find anything that matched his descriptions. On the way back from the harbor I did get my first real photo op with the Santa Cruz Island fox. 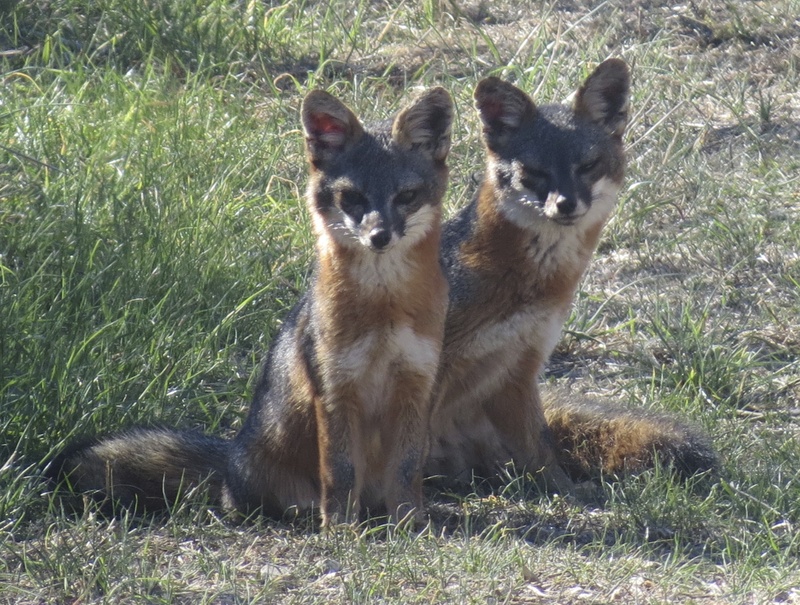 It was actually a pair of them and true to their fox nature they exuded cuteness. Past the fox scene I stumbled across a cattle trough I hadn’t noticed on the hike in. 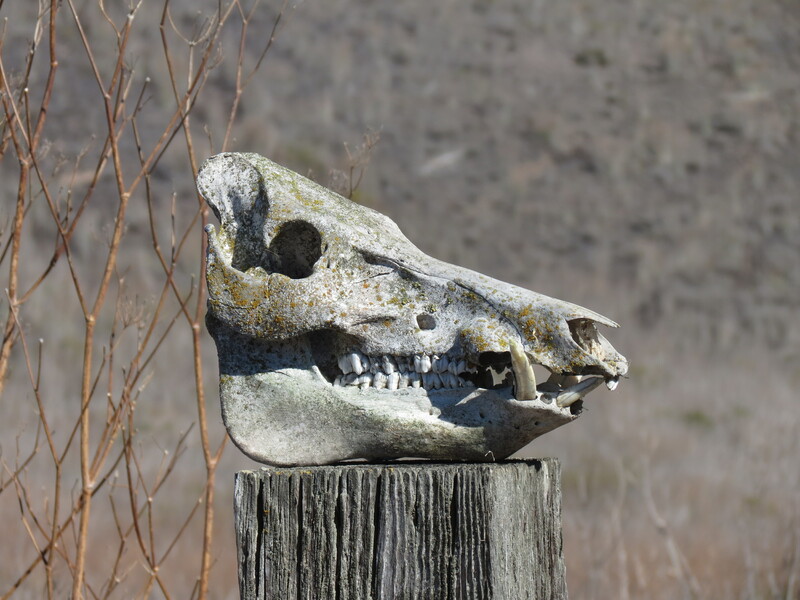 Poking around I found a wild boar skull, which I felt compelled place on top on an old fence post for decoration. At the turnoff to Chinese Harbor it occurred to me that I had plenty of time to take an alternate route back to camp and see more of the island, and so I climbed the road that leads up to the Navy Road. Great views of Montañon Ridge in the distance. The “high road” route back to camp also included some great views south and east towards Anacapa and Santa Barbara Islands. The route also leads past the Navy facility and their impressive solar array. From Navy Road there’s a connector road that leads back down to Del Norte Camp. And as I headed down towards camp it occurred to me that I still had enough daylight to cross-country hike down to the road cut I’d seen the day before. 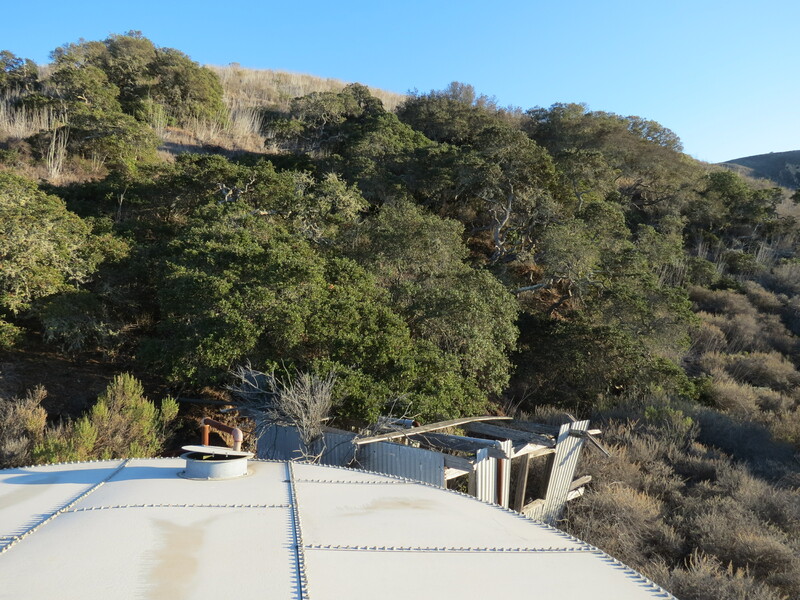 Once on the old road cut I followed it west as it rounded the hillside and to my surprise came upon an old water tank. 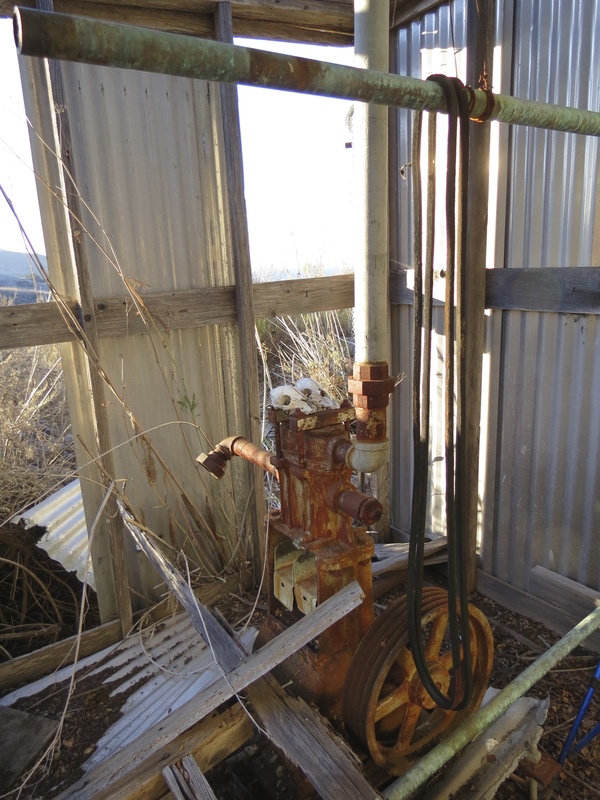 Hiking past the tank led me to essentially a pump house. Perhaps this was the spring Mr. Morris’ wrote about. 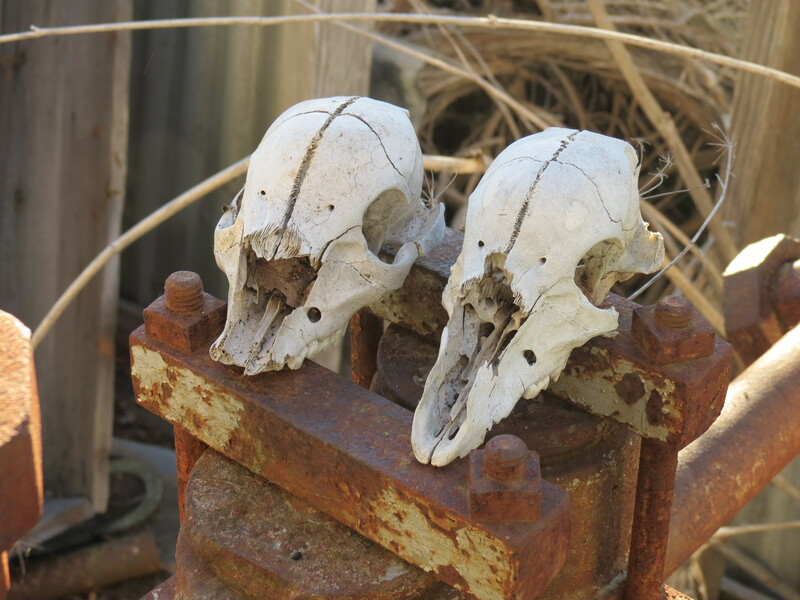 (Also found two fox skulls at the site). Once back at camp I was surprised by how many people were now there, and the different approaches they’d taken to exploring the island. Next to my camp was a group of four campers who had arrived Saturday morning with their kayaks and gear. They’d kayaked along the coast from Prisoners to Tinker’s Cove and back, and then backpacked up to Del Norte Camp for the night. An account of their adventures can be found on their blog, Misadventures of a Red Head. Past their camp was another couple who’d arrived at Scorpion Anchorage on Saturday and backpacked the 11.5 miles across the island to Del Norte Camp. And their plan was to get up early and hike to down Prisoners and tie in with the docent led hike to Pelican Bay, which of course got me to thinking. I had been toying with taking the high road back to Prisoners as way to see a little more of the island that I hadn’t seen before, but maybe I could do both. 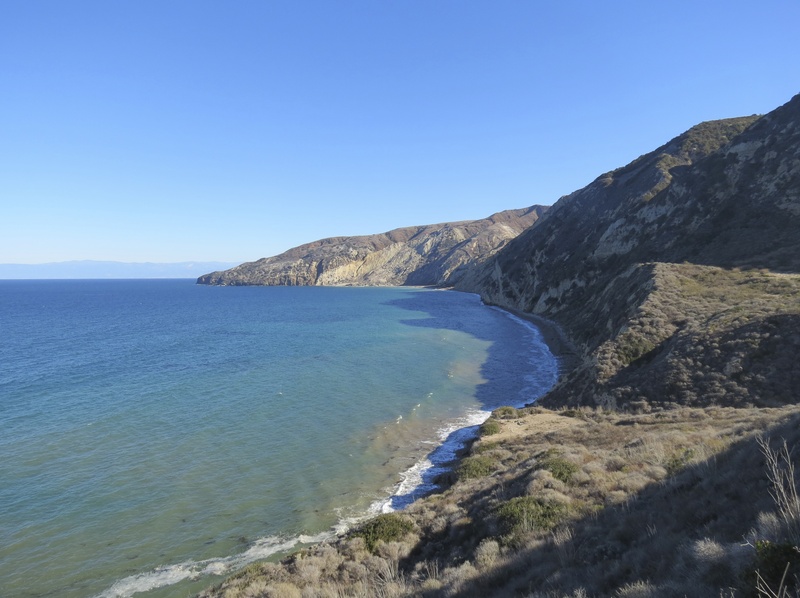 William had a similar thought and I caught up with him along the Navy Road, and while hiking mentioned to him that the National Geographic map of the Channel Island showed a trail on the ridge that ran along the eastern side of Eagle Canyon, which I was thinking of taking. The trail piqued his interested and he joined the trek. Turns out like several other trails on the NG map the trail doesn’t really exist, having become overgrown with fennel. Nevertheless it was a fun hike, particularly in the context of the overgrown trails one can find in our Los Padres. An adventurer at heart William filmed the expedition for a future post, commenting that we must’ve hike at least mile through nothing but fennel. We made it down to Prisoners just in time to catch up with the hike to Pelican Bay. The hike to Pelican Bay was a nice bonus to the trip with several fox sightings. On the hike back it started to rain. which actually made me wish I could stay an extra day as I’d been wanting to see what the islands were like during the rain.